Japan Hotel REIT has reopened the Oriental Hotel Fukuoka Hakata Station after a six-month renovation programme that has increased the number of rooms available from 192 to 221. The renovation has also enhanced the hotel's facilities, including a fitness gym and a rooftop garden on the 5th floor. Other improvements have been conducted with the electricity, heating, ventilation and air conditioning systems, which have been replaced by energy saving and environmentally friendly systems. The guest rooms were renovated to accommodate at least two people with room layouts suitable for inbound and domestic leisure guests. The rooms feature a “Natural × Cool” design concept, bright, refreshing and natural textures are incorporated throughout to realise a pleasant and refined space. 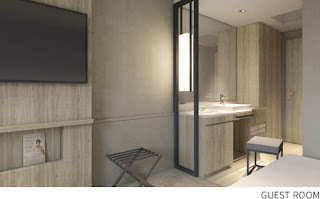 Moreover, all the guest rooms feature washbasins located outside the bathrooms for more spacious bathrooms, which is one of our special design features. By extensive revision of banquet and meeting rooms, the hotel better satisfies diverse needs of various hotel customers. The hotel is conveniently located at a minute walk from JR Hakata Station and has direct access to Subway Hakata Station in the basement, providing a direct connection to Fukuoka Airport - just a five-minute train ride away. More details and reviews, see trip advisor.